I am here at the registration desk for the 2011 Chilly Half Marathon and Frosty 5K run (March 6th), at the Waterfront Hotel Downtown Burlington, one day before race day. The place is hopping with people coming and going with bid numbers, Mizuno long sleeve shirts and very cool Chilly bags filled with lots of goodies and coupons. Participants are interacting with the various trade show booths including Peak Centre, Cardio-Cox Boot Camp and the Running Room. I meet a lady from the states that has participated in this run since 1999. It is one of her favorites and loves to come to Burlington to kick off her running season. She stays at the event host hotel, shops in the downtown and eats at local restaurants. Kelly Arnott, the Race Director, states that everything is ready to go and the course is going to be amazing, along with the weather. 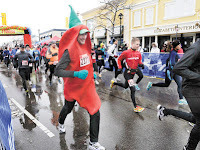 The half marathon walk/run will start at City Hall at 10:05 and the 5km walk/run at the Waterfront Hotel Downtown Burlington at the same time. The half marathon course will take the runners along Lakeshore Road East to Burloak and back. It is a beautiful, flat, scenic run with lots of water stations along the way. 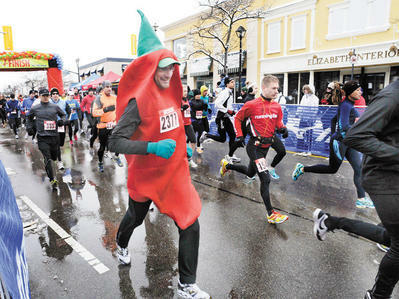 The post race Chili Party sponsored by Stag Chili will take place at the Waterfront Hotel Downtown Burlington and Coffee Cultures Café and Eatery is offer FREE coffee pre and post race time. A FREE shuttle service is also being offered from Mapleview Shopping Mall to the downtown. The VRPro team of staff and volunteer do an amazing job hosting this race and proceeds from the race will go to the purchase of portable ultrasound machine for Joseph Brant Memorial Hospital. We wish all participants a safe and successful run/walk and thank them for coming to Burlington.